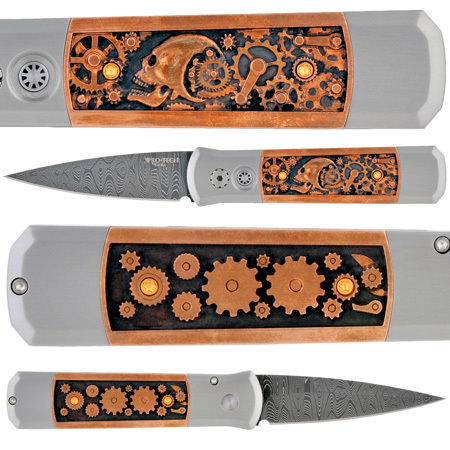 This area of our website contains examples of our custom “one of a kind” Pro-Tech automatic knives that we have built. Please understand that these exact knives can not be duplicated. If you are interested in having a custom knife made, we have a wide range of options to select from that can be applied to our various models. 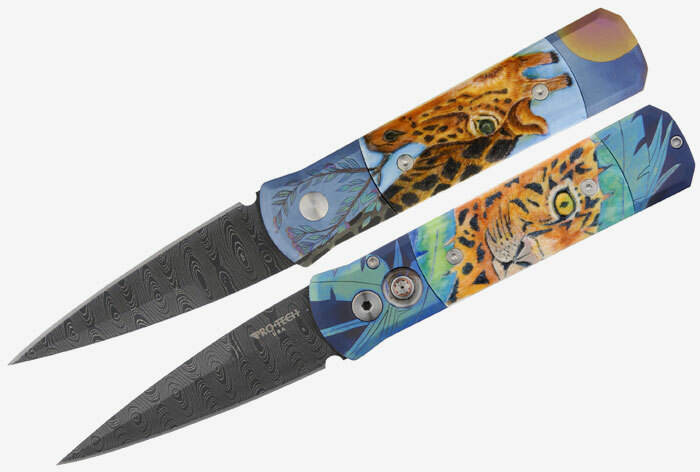 Contact your favorite Pro-Tech knife dealer or Pro-Tech directly for more information about our custom auto knives including available options and pricing. 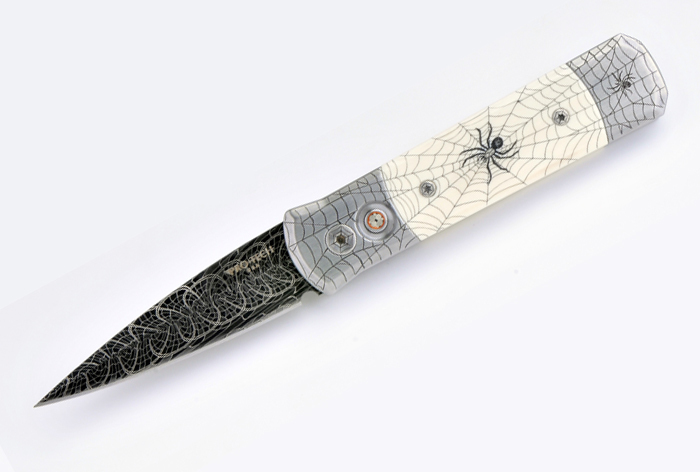 We recently upgraded our packaging on the Ultimate Custom knives. All of our top end engraved ultimate level knives now come with these beautiful wood boxes. The boxes come in three sizes and are black felt lined. Each box lid is custom laser engraved with the specific details about the knife as (pictured right). Boxes with custom engraving for special gift presentations are also available – contact Pro-Tech for more information. An extraordinary custom creation! 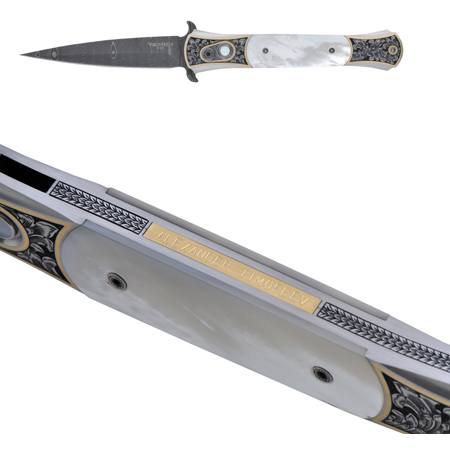 Custom Godson auto knife with hand satin finished steel frame, black lip pearl push button, a Chad Nichols stainless “ladder pattern” blade, and inlays are hand carved/engraved by Bruce Shaw out of solid brass bars! Five individually numbered pieces will be made. Only 5 of these incredible custom pieces will be made – individually serial numbered. A portion of the profit from each custom and production knife in this style sold will be donated to the Wounded Warrior Project. Solid 416 stainless steel frame built with hours of three dimensional CNC machining to create subtle curved surfaces; satin finished by hand to perfection, then expertly engraved and gold inlaid by the incomparable Julie Warensku, with pre-ban certified ivory inlays, mosaic pin push button, and high contrast mosaic Damascus blade by Robert Eggerling. Happy birthday Mr. Alexander Timofeev of Moscow, Russia! 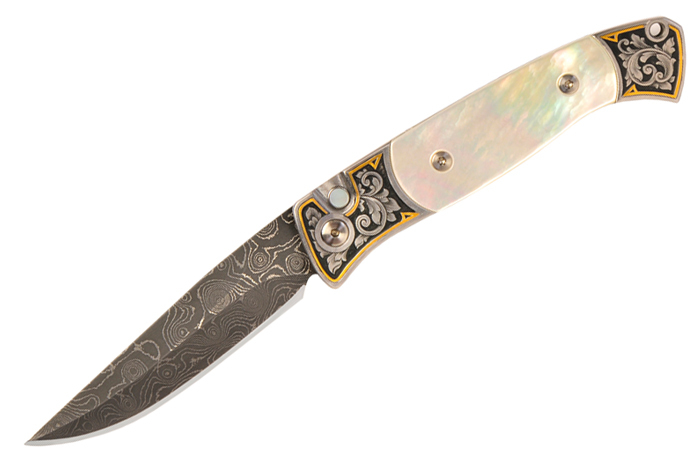 Extraordinary custom knife with hand satin steel frame, presentation grade mother of pearl inlays, matching pearl inlay push button, Chad Nichols stainless graduated ladder Damascus blade, incredible scroll engraving, 18kt gold, and solid 18kt gold nameplate by Bruce Shaw. Contact your favorite Pro-Tech dealer or our factory directly to see about a special custom creation for you. One of a kind! Steel frame with deep relief “Eagle with Stars & Stripes” engraving by Bruce Shaw, pearl push button, and hand ground\mirror polished blade by Walter Brend. 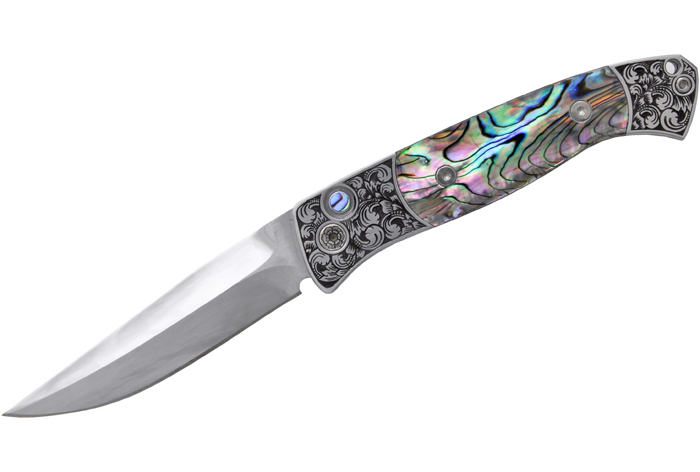 This incredible custom creation features a solid 416 stainless steel frame with hand satin finish, large presentation grade mother of pearl inlays, a matching pearl inlay push button, awesome Devin Thomas stainless Damascus blade. Limited to only 10 pieces – this heirloom quality custom piece is engraved on the entire surface of the frame by master engraver John Pease with incredible attention to detail. 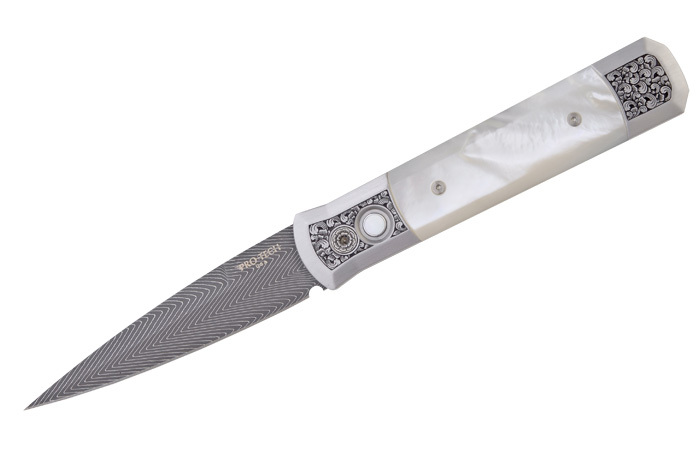 Old world craftsmanship and precision knife making have come together in a solid steel delight! A special limited group of our TR-3 model with Walter Brend hand ground and mirror polished blades with a variety of handle configurations – each individually serial numbered. These special knives sold out very quickly – if you have an opportunity to buy one on the secondary market, we suggest you take it! 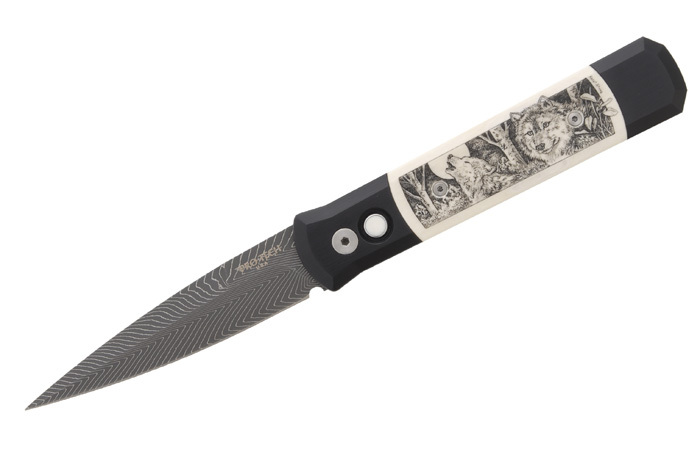 The Brend Hand Ground TR-3 also won the “Best of The Rest” Professional Knifemaker’s Association award. 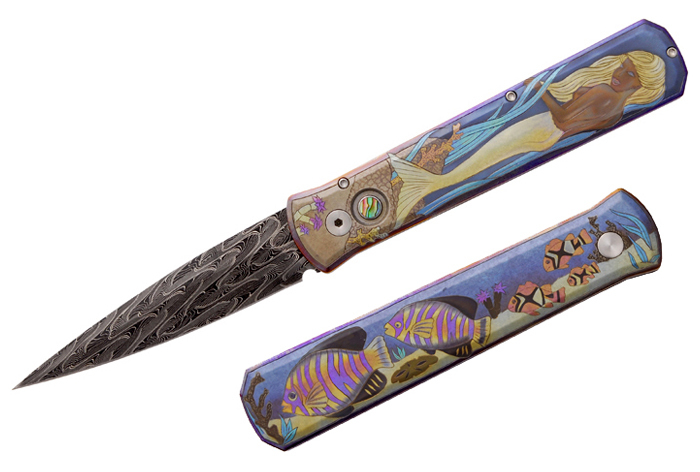 Incredible Custom Set – 5 steel frame TR-2 with black lip pearl push button, mirror polished and hot blued Damascus blade; each hand engraved with deep relief African animals and scroll work by Bruce Shaw. Custom built presentation box. $10,000 Retail – one of a kind. We do have some plans to build other Big 5 sets with other knife models and configurations, please email or call for more information. 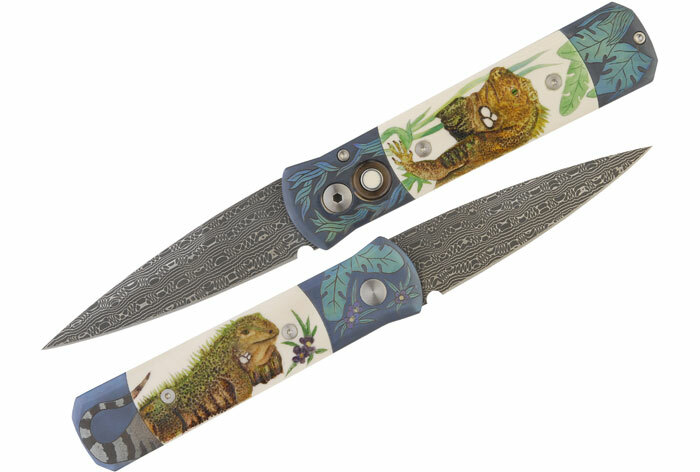 Another one of a kind art knife from the incomparable Judy Beaver – this Godson has a combination of titanium and ivory that has been carved and colored with giraffe\leopard theme – we only get a few knives a year from JB – a rare Godson gem indeed! 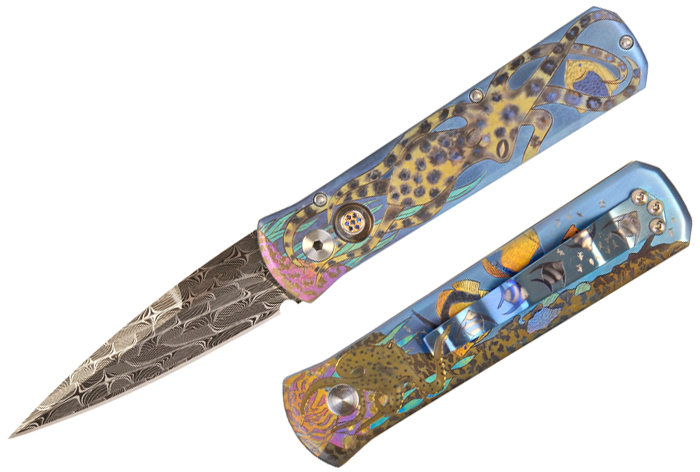 Another one of a kind art piece from the masterful engraver Judy Beaver – this Godson features solid titanium frame, Eggerling Damascus blade, push button inlaid with 18kt gold and sapphires, and incredible JB engraved and colored Octopus/Ocean theme. 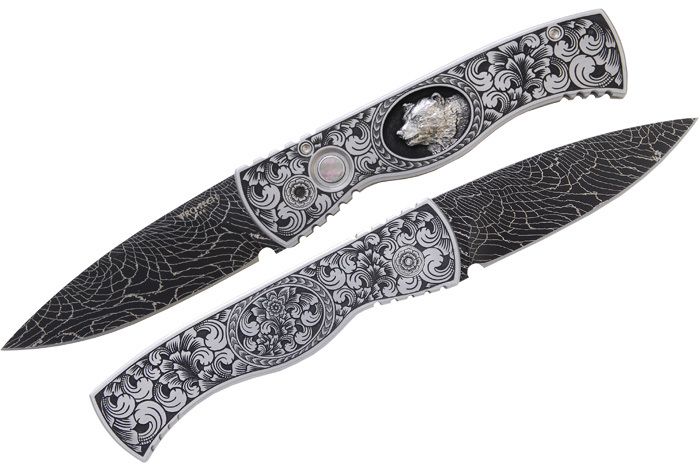 One of a kind custom piece “CALI” – commissioned by one of our customers, this incredible one of a kind Doru features the artistry of Judy Beaver set in solid titanium, San Mai with S30v core Norris Damascus blade, and black pearl push button. Solid steel art on a large scale!!! 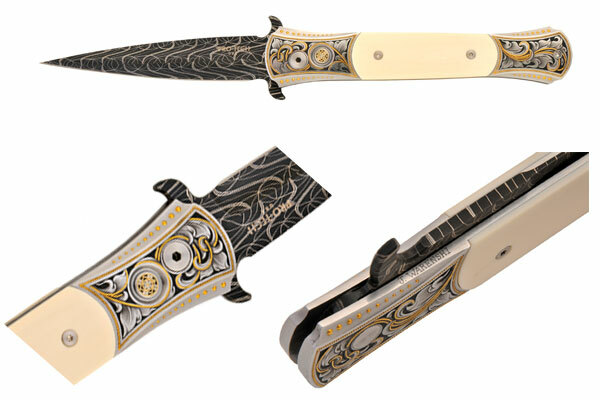 Our Large Don with 5″ blade – this one has it all: a hand satin finished stainless steel frame, pre-ban elephant ivory inlays, matching ivory inlay push button, Chad Nichols stainless Damascus blade, and incredible deluxe scroll engraving with gold inlays by Bruce Shaw. A rare specimen of solid steel craftsmanship. This is really an incredible example of our custom Large Don Auto knife. 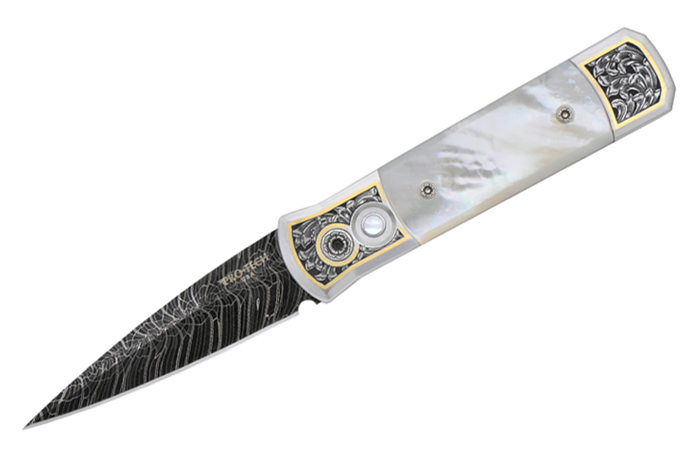 Hand Satin 416 steel frame, black lip pearl inlays, matching black pearl push button, Bruce Shaw deluxe leafy scroll engraving with 18kt gold inlay, and Chad Nichols stainless Damascus blade. Our first two Julie Warenski engraved custom Pro-Tech Knives! Incredible hand engraving with gold inlay on these one of a kind pieces. A Warenski engraved Don will take more than a year from time of order – and we can promise – it’s worth the wait!!! For availability and more details, please contact your Pro-Tech Dealer or us directly! 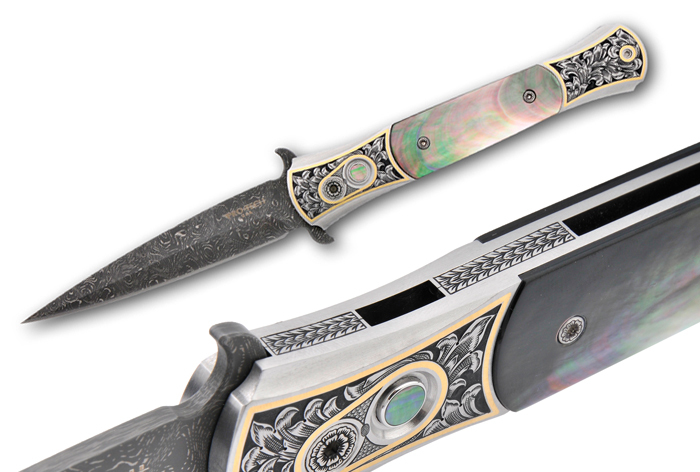 Completely Custom Don – this incredible piece features a solid 416 stainless steel frame with deluxe leafy scroll engraving and 18kt gold inlays by Bruce Shaw – this is Shaw’s most elite style of engraving and only a few pieces in this range will be done each year. 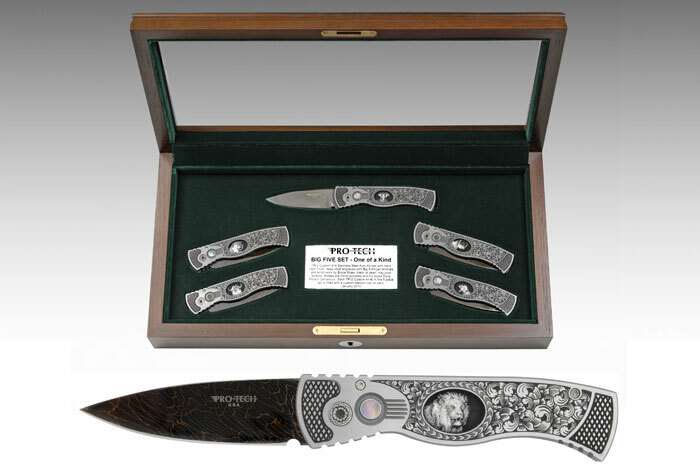 Rare black lip pearl inlays, matching black pearl inlay push button, and mirror polished and hot blued Eggerling Damascus blade. 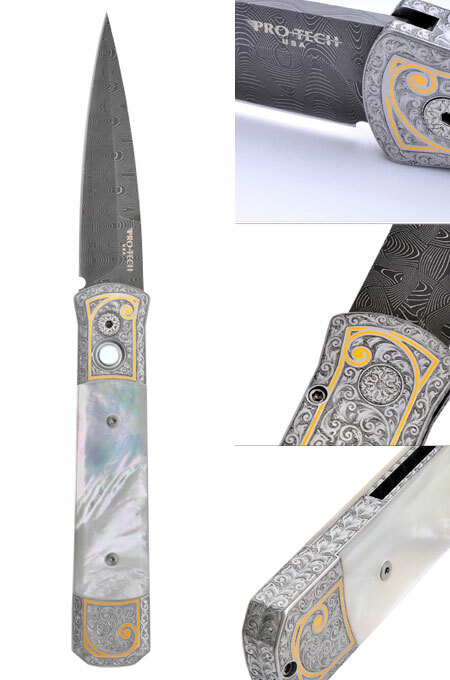 Ultimate Custom Godfather – solid 416 stainless steel frame with beautiful 1000 grit hand satin finish, large scale mother of pearl inlays, matching pearl inlay push button, incredible Devin Thomas stainless “Herringbone” pattern Damascus blade, and Bruce Shaw hand engraved front and back. Our first scrimshaw piece from Linda Karst Stone. 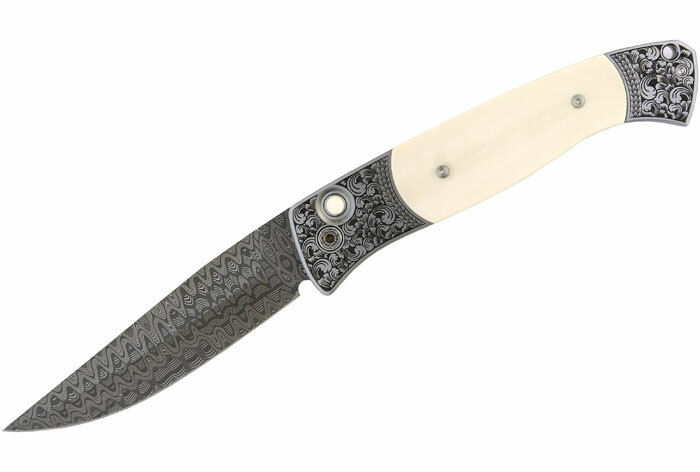 Black aluminum frame with incredible Devin Thomas stainless “Herringbone” pattern Damascus blade, certified pre-ban ivory inlays, matching ivory inlay push button, custom scrimshaw on front of knife, and custom titanium clip on back. 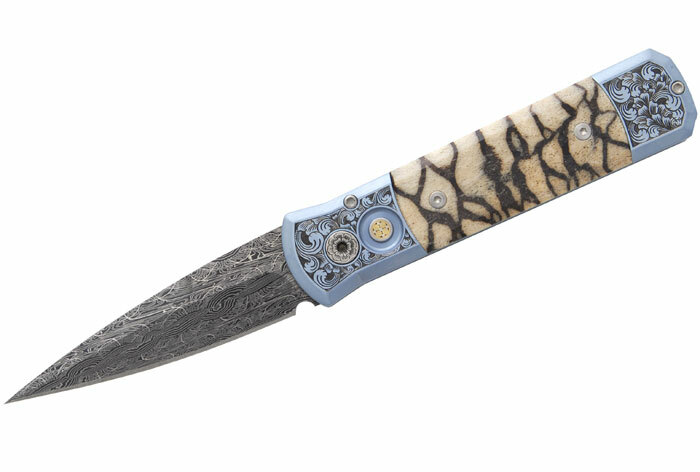 Special one of a kind TR-2 with solid 416 stainless steel frame, black lip pearl push button, Ponzio high carbon Damascus blade, and deep relief and scroll engraving by Bruce Shaw. One of a kind custom Pro-Tech Emerson CQC7 Auto! 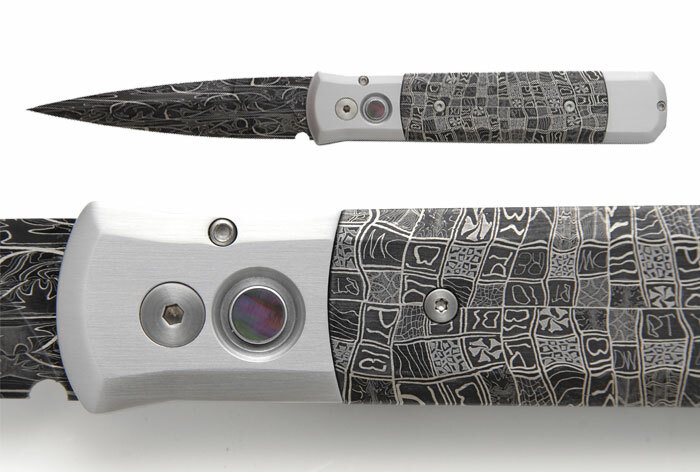 This unique piece has a hand satin finished 416 stainless steel frame, pre-ban ivory inlays, mosaic pin push button, Chad Nichols stainless Damascus blade, and scrimshaw by Linda Karst Stone. 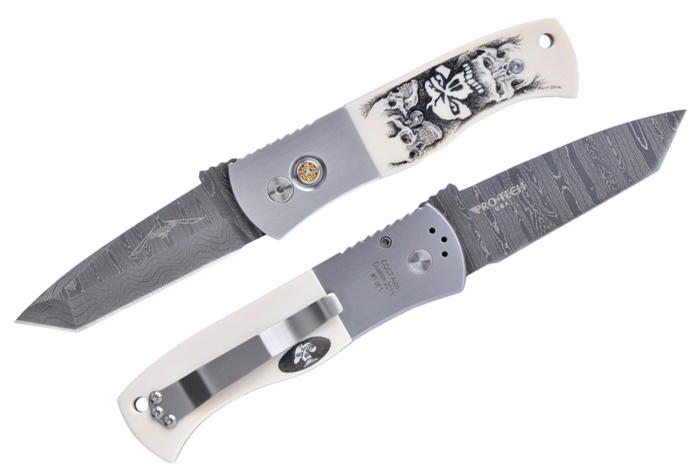 Incredible one of a kind custom piece engraved and scrimshawed by Judy Beaver – this Godson features titanium frame, pre-ban ivory, matching push button, reptilian pattern Damascus blade. 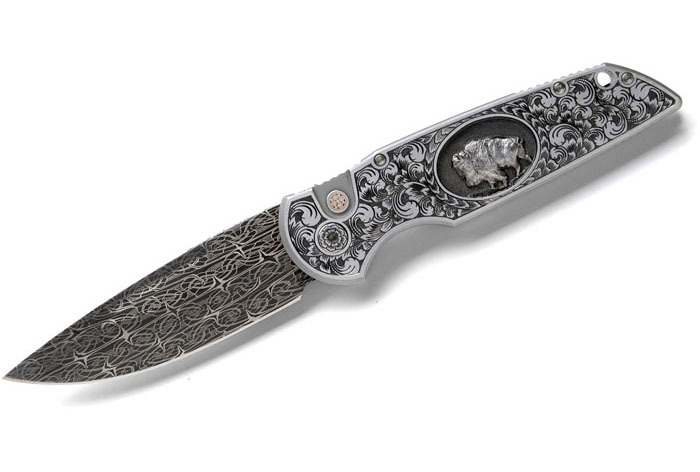 One of a kind custom piece with satin finished titanium frame, diamond shape inlay profile, Devin Thomas Damascus blade, full Bruce Shaw engraving front and back. The cover of our 2011 catalog, this extraordinary Ultimate custom Godson has it all! 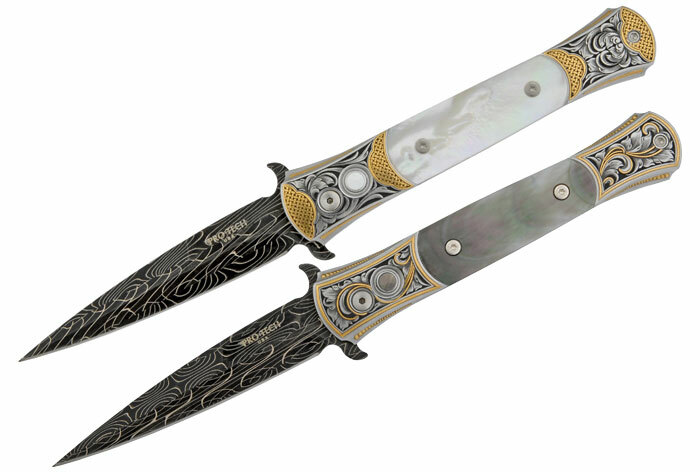 Hand satin steel frame with Bruce Shaw’s deluxe leafy scroll engraving with 18kt gold, mother of pearl, and Eggerling Damascus. 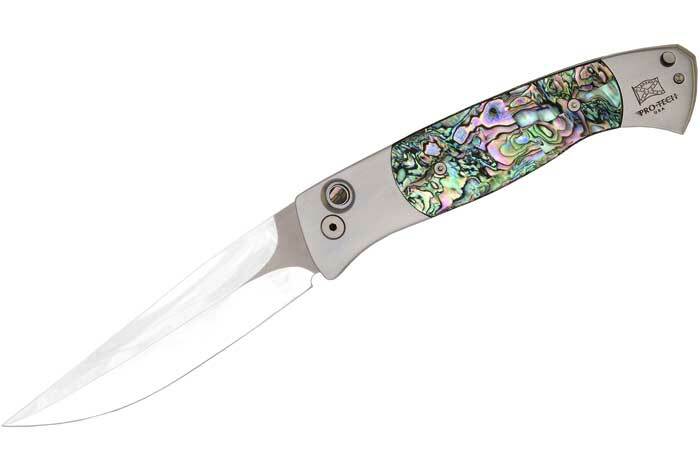 One of a kind Large Brend custom piece with hand satin finished 416 steel frame, mosaic abalone inlays, matching abalone inlay push button, full Bruce Shaw engraving, and Walter Brend hand ground, mirror polished blade. 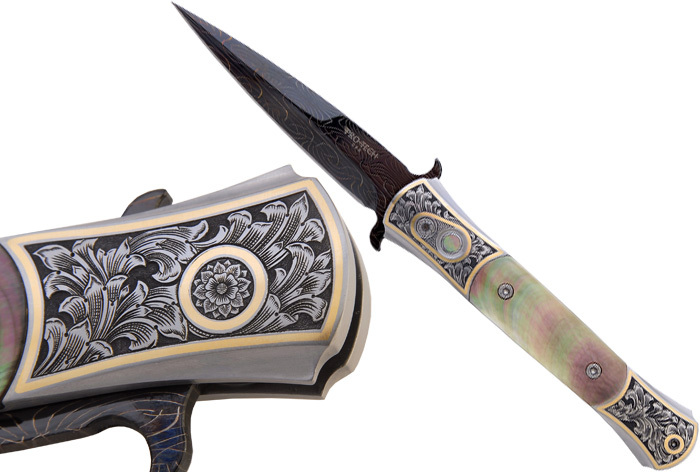 One of a kind Large Brend custom piece with hand satin finished 416 steel frame, pre-ban elephant ivory inlays, matching ivory inlay push button, full Bruce Shaw engraving, and Walter Brend hand ground blade featuring Mike Norris stainless Ladder Damascus. 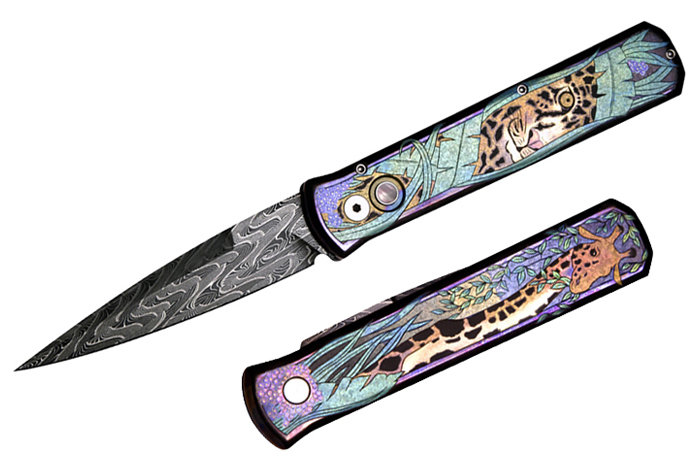 Full custom solid 416 steel frame with hand satin finish, mosaic abalone inlays, matching abalone inlay push button, Walter Brend hand ground and mirror polished blade. 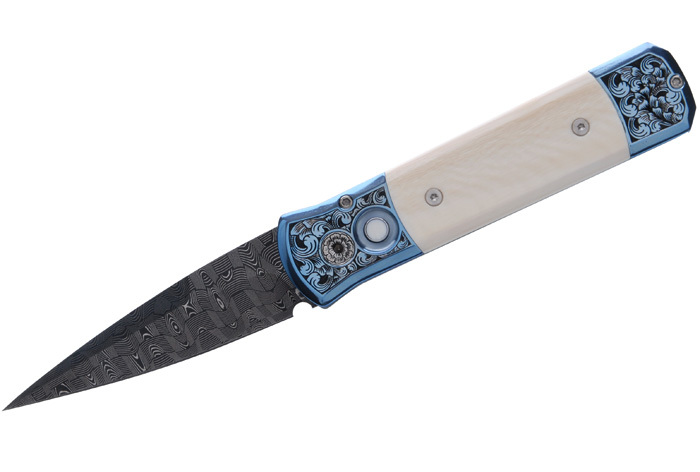 Full custom solid 416 steel frame with hand satin finish, mastodon tooth inlays, mosaic pin push button, Walter Brend hand ground and mirror polished blade. 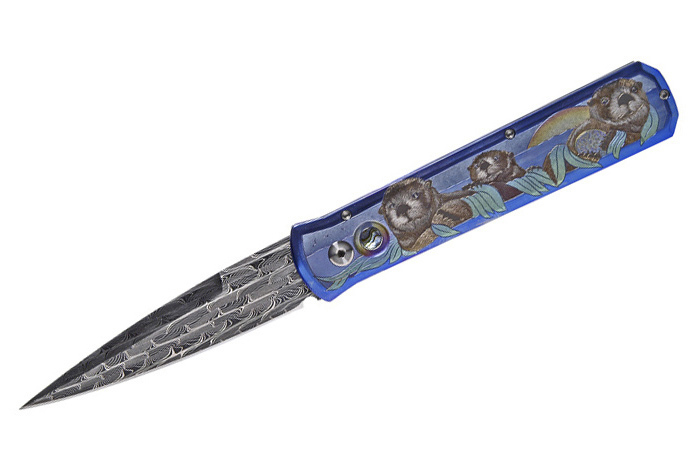 Elegant dress knife! 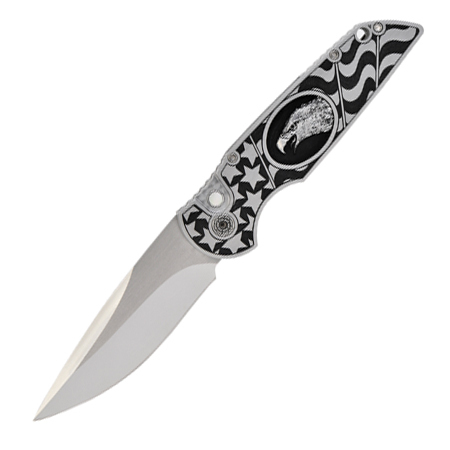 This is a beautiful custom small Brend Auto (2.9″ Blade). Satin steel frame with beautiful engraving and 18kt gold by Bruce Christensen. 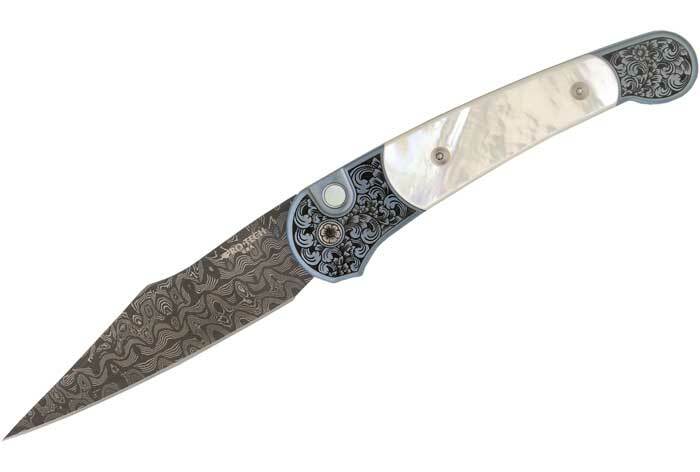 Pearl inlays, matching pearl push button, stainless Damascus blade. Chad Nichols high carbon Damascus frame, mirror polished and heat colored with mother of pearl inlays, matching pearl inlay push button, and Chad Nichols stainless Damascus blade. Titanium frame with full Bruce Shaw engraving, beautiful mother of pearl inlays, matching pearl inlay push button, and Chad Nichols stainless Damascus blade. 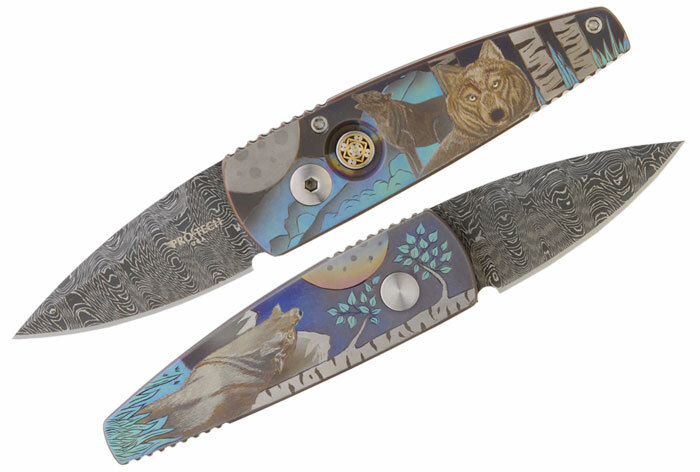 Wolf Stinger – titanium frame with full engraving and coloring by Judy Beaver, Devin Thomas high carbon ladder Damascus blade, mosaic push button. 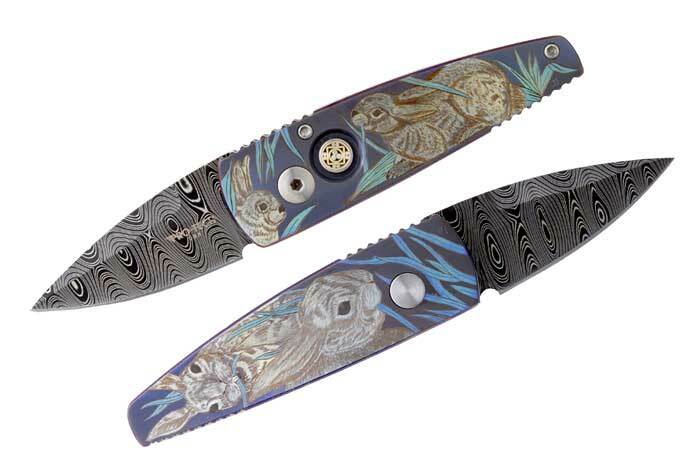 Rabbit Stinger – titanium frame with full engraving and coloring by Judy Beaver, Devin Thomas high carbon ladder Damascus blade, mosaic push button. Special Limited Edition Eggerling PT10 Damascus Inlays – sold in Godfather/Godson Sets. A total of 17 Sets will be built to commemorate our 10th year anniversary this year. 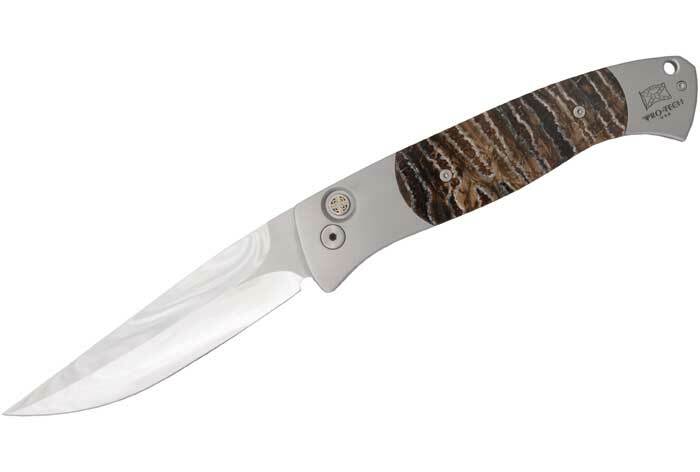 The first 6 sets will be solid stainless steel frames, black lip pearl inlay push buttons, Eggerling Damascus blades, Eggerling Custom PT10 Damascus inlays, and custom titanium pocket clips. $3,000 per set. 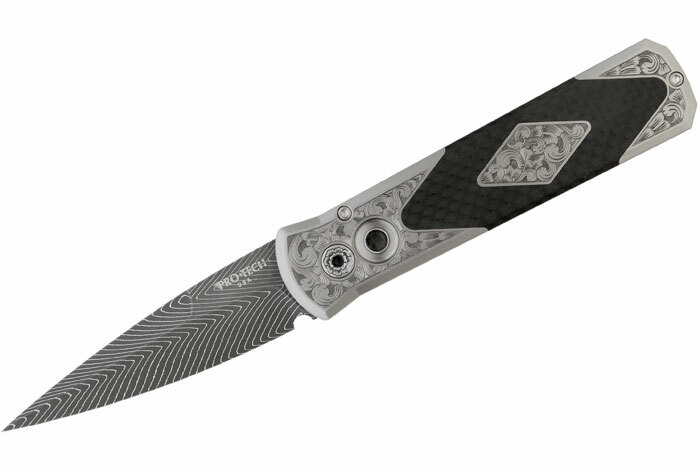 The next 11 will feature the same Eggerling PT10 inlays, silver anodized aluminum frames, black lip pearl inlay push buttons, hand mirror polished blades, and custom titanium pocket clips. $1,600 per set. 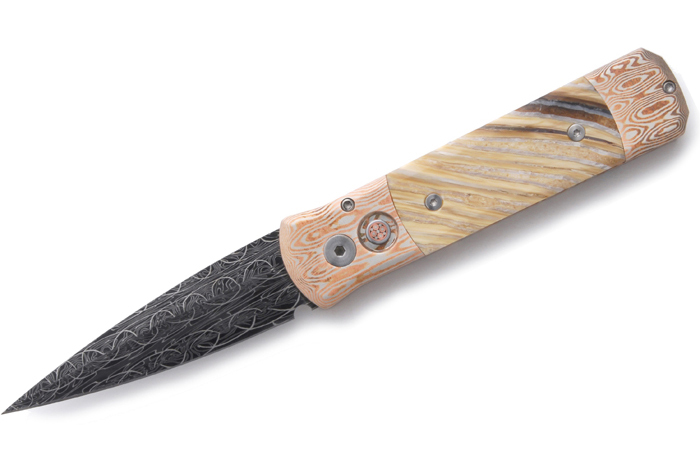 Another extraordinary custom Godson with hand satin finish titanium frame, tiger coral inlays, tight woven Eggerling Damascus blade, and full Bruce Shaw engraving. One of a kind! 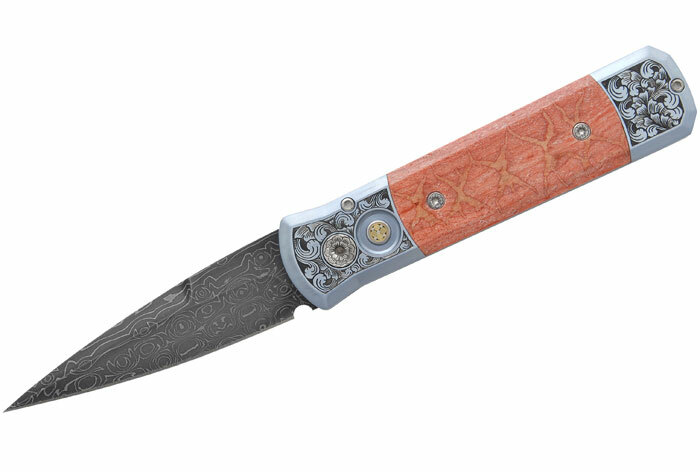 Hand Satin finish titanium frame, red apple coral inlays, Devin Thomas “Vines & Roses” Damascus blade, and full Bruce Shaw engraving. This incredible piece is a custom titanium Godfather with Robert Eggerling Damascus and colored engraving by Judy Beaver. Double sided engraving and coloring. Custom Titanium TR-3 with Robert Eggerling Damascus blade and hand engraving by Bruce Shaw. Deep relief engraving of buffalo with scroll work all around. Ultimate Custom Godson, hand satin finished titanium frame, light blue anodizing, fully engraved by Bruce Shaw with pre-ban Ivory inlays, matching ivory inlay push button, and Devin Thomas high carbon “Basket Weave” Damascus blade. This is an excellent representation of the “Ultimate” Custom Godson. 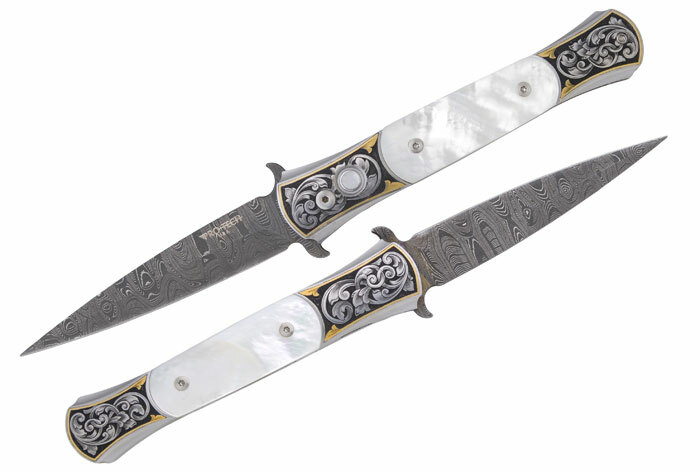 Mirror Polished titanium frame, beautiful pearl inlays (front\back of handle and push button), Eggerling Damascus blade, full Bruce Shaw scroll work engraving. Deep relief engraving from Bruce Shaw. Mirror polished titanium Stinger with Devin Thomas “Reptilian” Damascus blade. Another beauty from Judy Beaver. 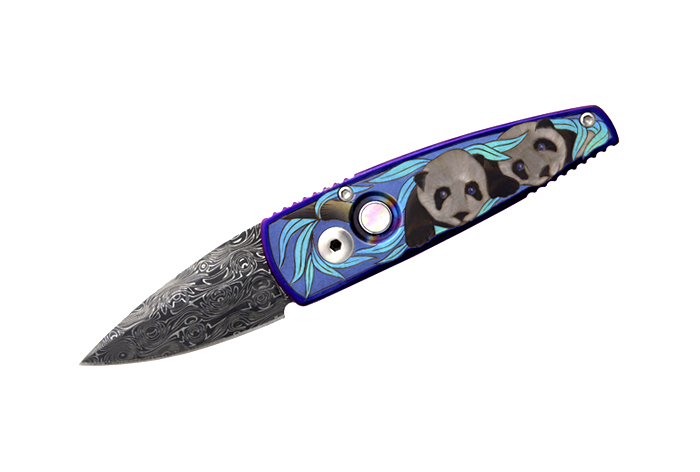 Custom titanium Stinger with full color engraving of “Pandas” with Devin Thomas Fireball Damascus blade and pearl push button. 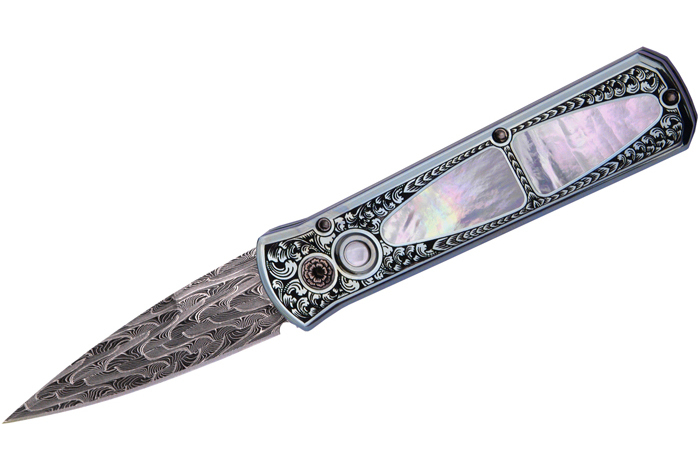 Solid titanium Godfather with Robert Eggerling Damascus blade and abalone inlay push button. Another amazing color engraving job by Judy Beaver. Sea Otter Family engraved front and back. 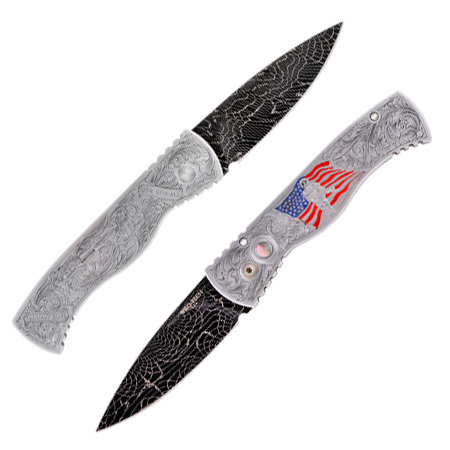 This Custom Godson features a solid titanium frame, one of a kind patriotic theme Eggerling mosaic Damascus blade with “Stars & Stripes” and deep relief eagle engraving by Bruce Shaw. 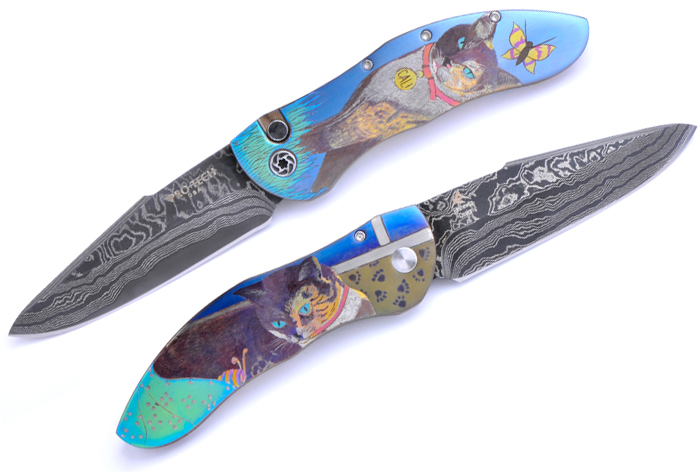 Extraordinary colored hand engraving by Judy Beaver on this one of a kind Custom Godson. Fully Engraved solid titanium frame with Eggerling “Roots” Damascus blade. One of a kind art piece. Solid Mike Sakmar mokume frame with mastodon tooth inlay and Eggerling “Roots” Damascus blade. A one of a kind custom piece commissioned by a good customer. 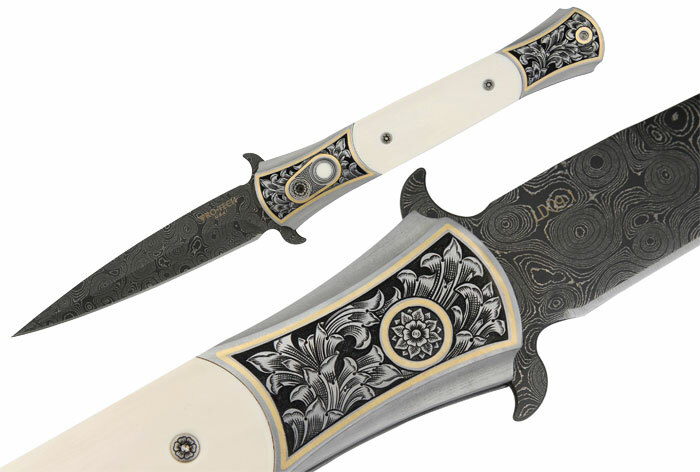 This exceptional custom Godson features a hand satin steel frame, pre-ban ivory inlays, Eggerling mosaic Damascus blade, and a combination of artisan work from Linda Karst Stone (scrimshaw) and Bruce Shaw (engraving on steel). 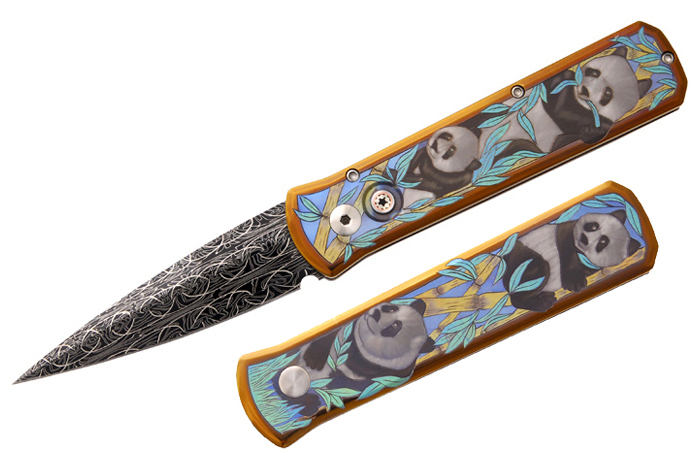 Judy Beaver colored hand engraving custom Godfather. 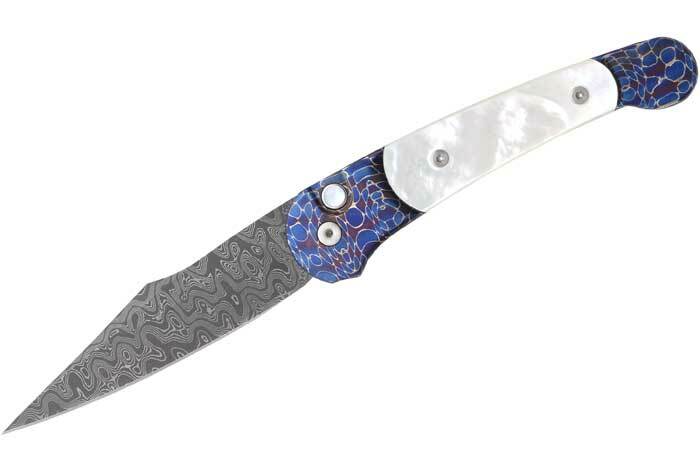 Solid titanium frame featuring full engraving, abalone inlay push button, and Eggerling mosaic Damascus blade. 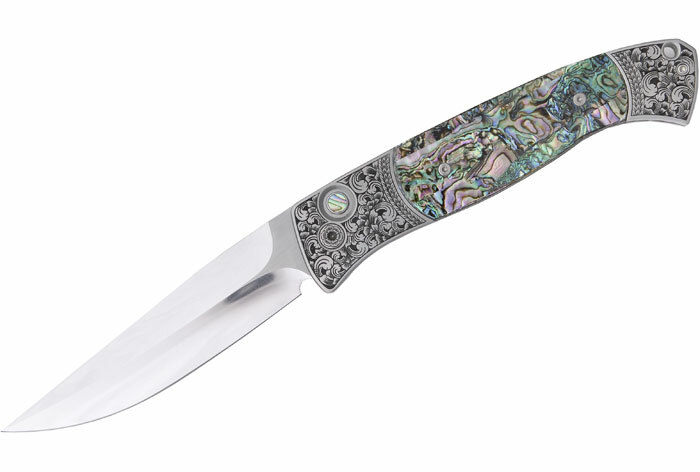 Walter Brend hand ground, mirror polished blade with 416 steel frame, abalone inlays, and full hand engraving by Bruce Shaw. One of a kind.